Haven't made one of these for quite a while. 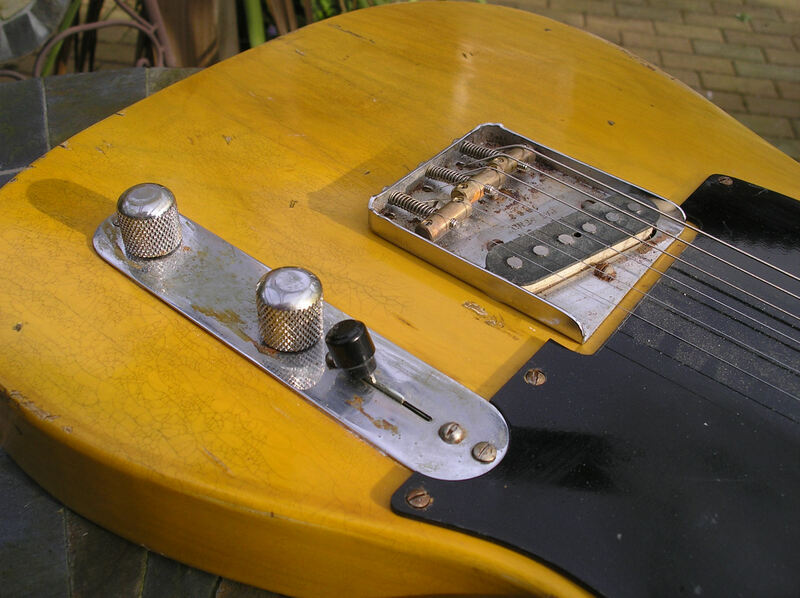 This one has all the very early features, slotted screws, no-line Kluson tuners, painted bakelite guard, milled jack socket, basically all the features you'd expect to find, as usual, built and finished to exacting vintage specification. Let's press on with some pictures accompanied with more details. Here's the whole thing, I went for an almost "closet classic" look with this one. 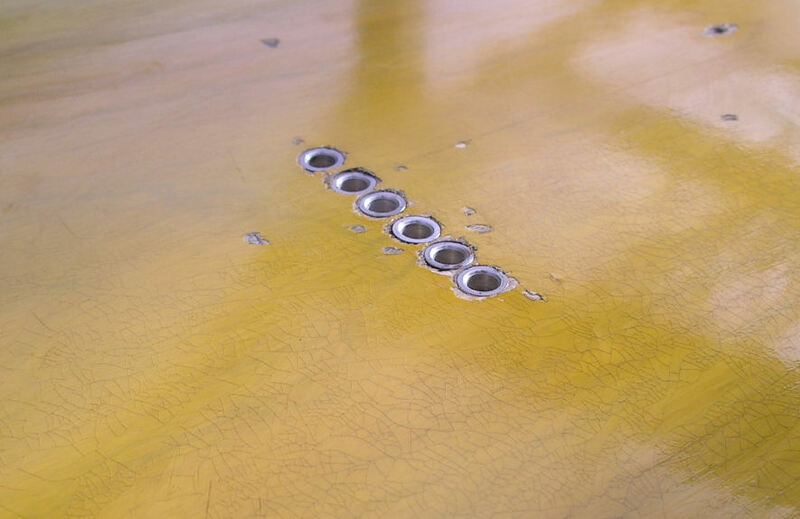 The finish is completely done in nitro cellulose and is a semi transparent butterscotch blonde. 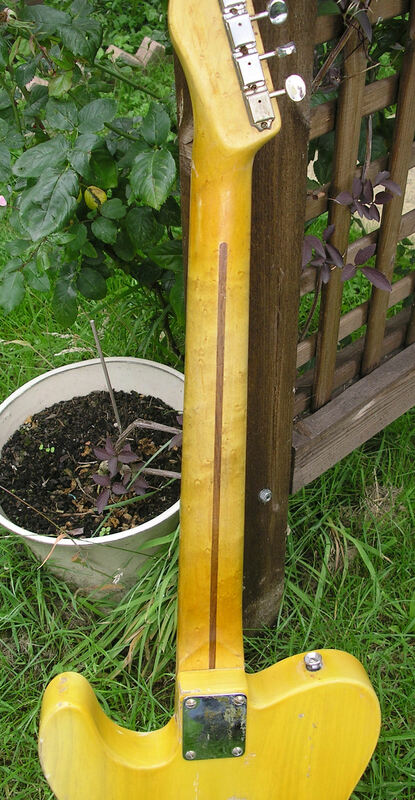 The body is built from two piece swamp ash t, not centre joined and with a very good matching grain and typical of genuine swamp ash it is very light weight. 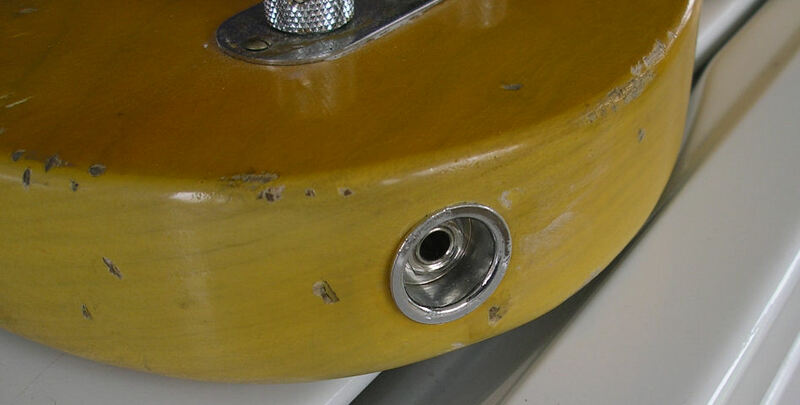 You'll notice in subsequent pictures that the finish has some nice fading incorporated into it. 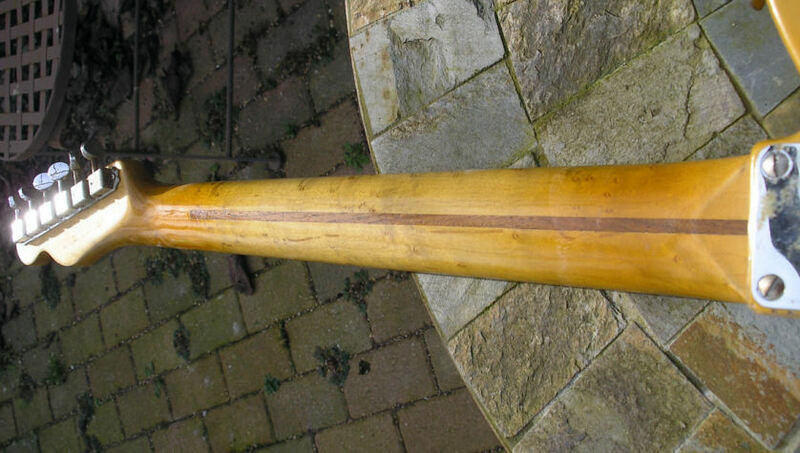 The wood I used for the neck has a really pretty birds eye grain, carved to have a slight "v" or boat profile with a 9.5 inch radius fretboard, notice the slot head neck screws. 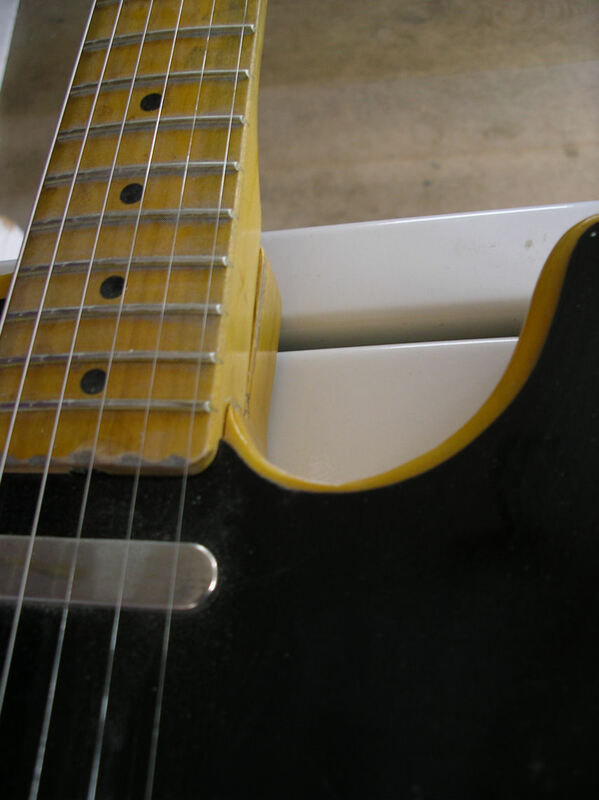 Close-up of some of the hardware, I've kept the ageing of the metal to dulling rather than serious rust, again slot head screws, also notice the serial number on the bridge which was a feature of the early guitars rather than being on the neck plate. The pickguard is painted Bakelite again with a little wear. Just a few "battle scars" to the paintwork, all pretty subtle. 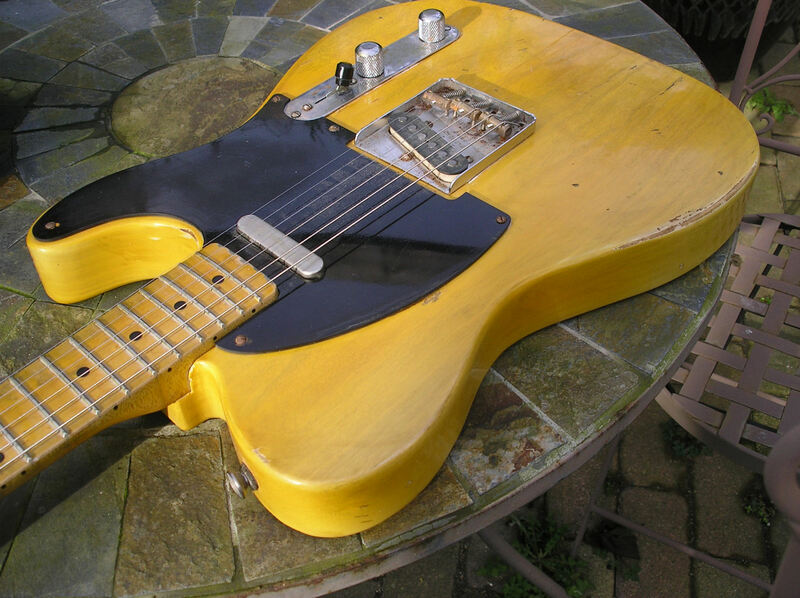 There were a few "flaws" in the early ones such as a the neck heal not quite matching the body and the "router hump" in the cutaway which has been reproduced here, I was luck enough to work on an original '57 Telecaster which I took an accurate template from. Another feature reproduced here is a turned (milled) jack socket, not one of the later pressed steel ones, these are knurled and simply pressed into the body. 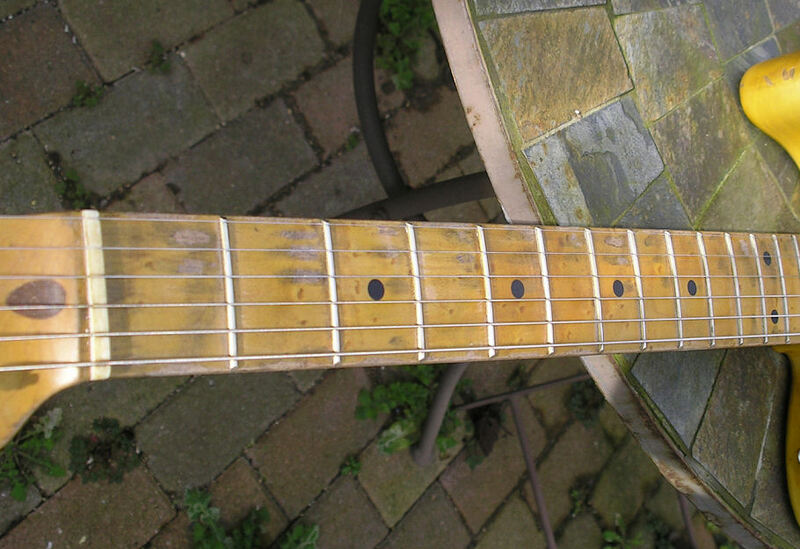 Lovely aged fretboard, always more difficult making a maple board look old rather than rosewood. ....And back of the neck, very nice subtle birdseye on this one. Minor details I know but important for period correctness, flush fitting string ferrules, originally these were typically inaccurately spaced as are these, also fine craze cracking in the lacquer! ...And just one more look! 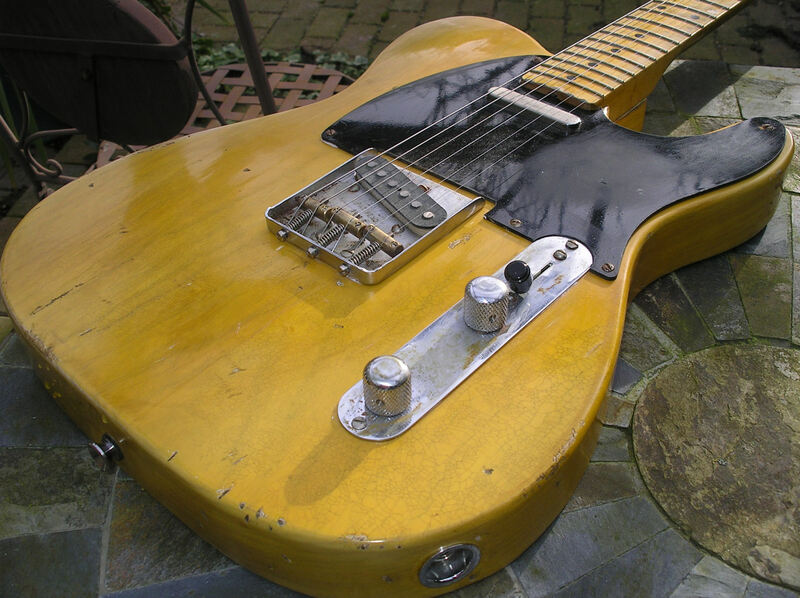 The internals of this guitar include CTS pots, CRL switch, cloth wiring, slightly more modern '60 wiring circuit. The pickups are custom wound in the USA by Dawgtown and I love them. This guitar has been made with all the best raw materials, genuine light weight two piece swamp ash body, gorgeous one piece birds eye maple neck and genuine hardware wherever possible. The nitro cellulose finish is vintage correct and is transparent butterscotch blonde that I mix myself and apply a bit uneven to give a subtle faded look, there is also very mild craze cracking. 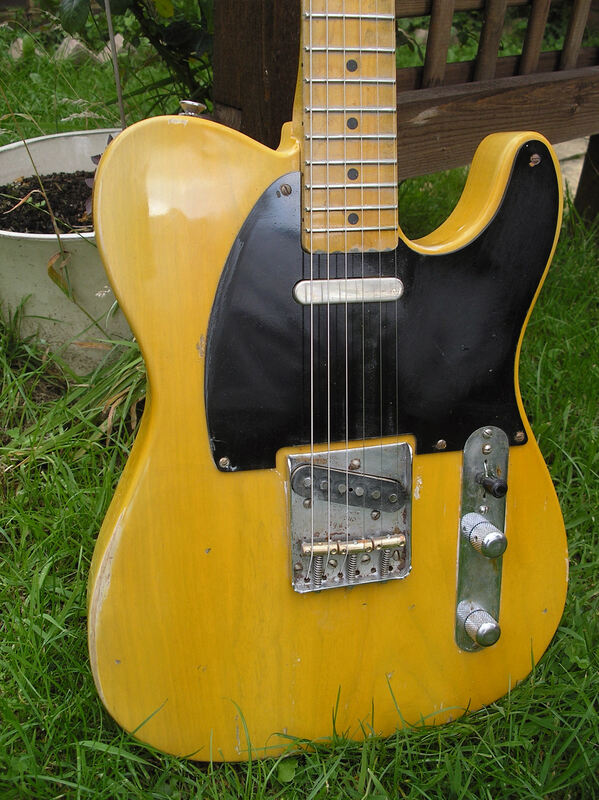 This is about as accurate as you're going to get, the guitar is lightweight and sound wise all I can say is that it's typical twangy vibrant Tele! Foot note: I had loaned this guitar out for a while to a professional guitarist, so it has now been set-up and plays seriously well. To be honest I rarely get a chance to give my guitars a real good thrash these days but I'm really impressed with the sound of this one, both acoustically and plugged-in it really does sing.